There is a considerably high demand for non metallic minerals and this demand seems to be up-surging every year. If you are a marketer looking to explore new business opportunities in this sector, Blue Mail Media’s Database of Non Metallic Minerals Miners can help you meet the purpose. 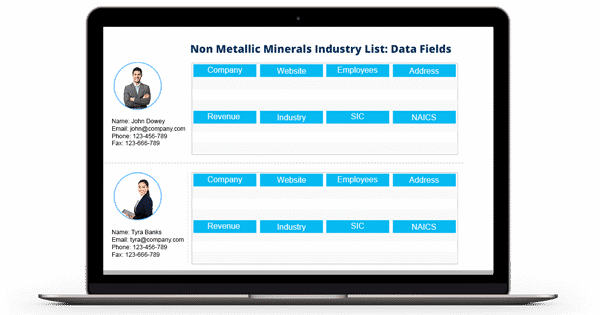 Blue Mail Media’s Non Metallic Mining Industry Mailing List gives you access to all the data you may need to connect with your target audience via telephone, email or mail. Our Database has been carefully built to help you meet your multi-channel marketing requirements. Being one of the most reliable marketing data vendors across the US as well as other countries, we put immense efforts in the collection, authentication, and update of our database so that our clients witness a visible increase in the response rate, conversion rate and ROI. Also, we don’t follow a one size fits all approach while serving our clients as we respect their unique marketing needs. This is why we provide pre-packaged Non Metallic Mining Industry Database to help our clients meet their immediate requirements and also offer to customize our database to perfectly align with client’s marketing objectives.